Cuttack, November 05, 2018: The All India Football Federation’s (AIFF) development side Indian Arrows registered their first win of the 12th Hero I-League campaign riding on an 11th minute Asish Rai strike to overcome Shillong Lajong FC at Cuttack’s Barabati stadium. The side from the Meghalaya hills were clearly out of depth in the heat and humidity of Odisha’s second largest city against a well-travelled Arrows unit and capitulated to a second successive defeat from three games, despite impressive performances in their first two outings back home. The Arrows, on the other hand, did extremely well to come back after a 1-4 loss to Chennai in their opening game. Arrows coach Floyd Pinto made a couple of changes to the eleven which started the first game against Chennai. Aimol began at right back in place of Jitendra Singh and Boris Singh replaced Sanjiv Stalin, who had a mediocre outing against Chennai, on the right side of midfield. 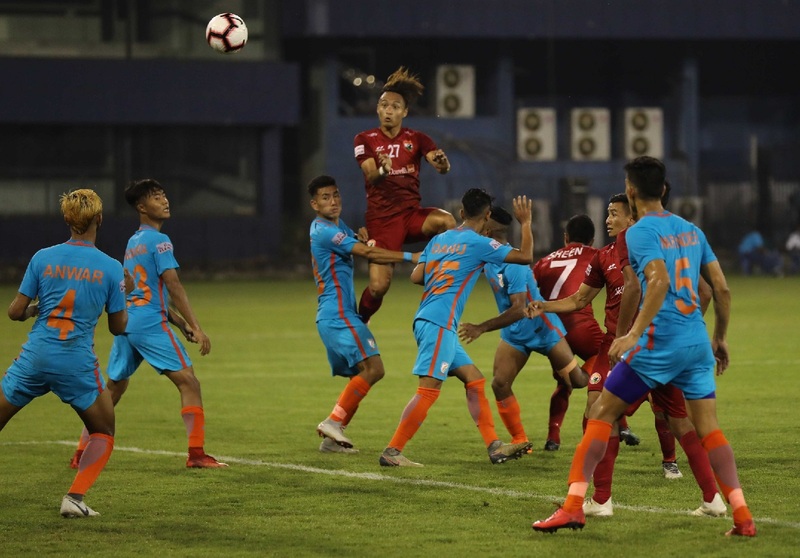 Alison Kharsyntiew, the Shillong head, on the other hand, opted for an unchanged eleven to the one which started against Quess East Bengal, playing a regular 4-4-2 with Mahesh Naorem Singh and captain Samuel Lalmuanpuia upfront. The Arrows then decided to sit back and hold on to the lead and play on the counter, a strategy which they have been brought up on quite well. Samuel’s low piercing corner from the right flank in the 19th minute seemed straight out of the training grounds and was aimed at Kenstar Kharshong’s head. The centre-back leapt up and connected with a perfect angled header but just missed the target by a whisker. There were a couple of bookings that referee Suman Kumar had to effect. Aniket Jadhav was booked in the 60th minute and was promptly replaced by Rohit Danu. For Shillong, Lalrohlua went into the books for a rash tackle on Boris. As the game neared the final whistle, Shillong stepped up the pressure and a couple of chances went abegging. In the 88th minute, off a Rakesh Pradhan cross from the left, centre back Aiban rose to connect with a strong header but Aimol affected a goal-line clearance to keep the Arrows lead intact. Then the captain Samuel earned a free kick in the last minute of injury time in the danger zone but his effort struck the Arrows wall. Having opened their account, Indian Arrows now rise to the fifth spot with three points whereas Lajong will continue to hold the fourth spot with three points having played one match more.